I know a lot of you are immediately thinking that I am just trying to find a way to make a fanny pack look “bushcrafty” and rugged. That is not the case – that I will admit to. The reality is that possible bags and belt bags like these have been used for hundreds of years by outdoorsmen. Adding something like this to my kit would be a great way for me to carry ammunition for my pistol and rifle, I can more easily carry fire starting gear, and it would be phenomenal for “snacks.” By “snacks” I don’t mean apples – I said, “snacks.” Even storage of a small hip flask would make this a worthwhile upgrade to my kit. The problem I am having is in finding something that I like that doesn’t look like a woman’s purse or a small set of saddle bags. I already carry a Baldric setup for my MP Dire Wolf knife. Adding this has got to make things easier and not just give me a reason to carry more crap. 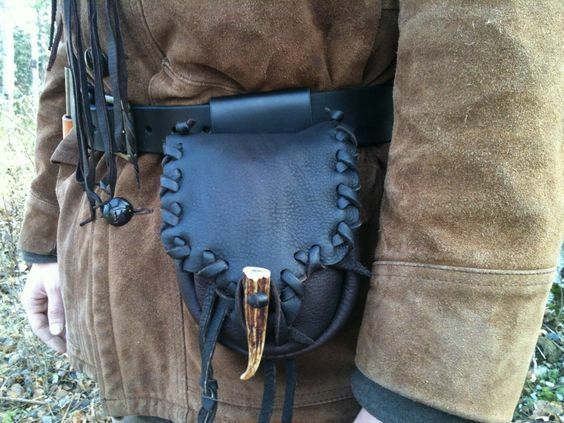 The alternative to a belt bag would be to carry a black powder possibles bag. These can easily be modified to carry my knife so that I don’t have to carry two items. The bad part is that I would have, without a doubt, a bushcrafting version of a murse (man purse). This doesn’t threaten my masculinity, but it does mean that I am one step closer to being considered either a hipster or a lumbersexual. Neither sits well with me. Most else goes in my ruck, if I carry one. These items are just those that I like to carry on my person at all times. Having them hanging from my belt just seems like a great way to ensure I am never without. It will take a lot more thought and trial before I commit to this addition. The functionality and convenience does make it seem like a good idea, however. If you see someone the size of a black bear wearing a black Wilderness shirt and a belt pouch it might not be a good idea to give me hell for the frontiersman fanny pack…. I am most certainly armed…….. Just saying. This entry was posted in Miscellaneous and tagged belt bag, belt pouch, bp bag, fanny pack, murse, possible bag, possibles bag on March 16, 2016 by Woodsbum.